Dr Peter Matton, Head of Roche Diagnostics Subregion South East, together with Peter Bratusek, Country Manager at Roche Diagnostics Slovenia, Croatia and Bosnia and Herzegovina and Duska Dojcinovic, Sales Representatives at Farmavita Ltd and other team members of Roche Diagnostics in charge of Slovenia, Croatia and Bosnia and Herzegovina visited the University Clinical Centre of the Republic of Srpska. At the very beginning of his lecture, Dr Matton explained the structure of Roche Diagnostics including The Centralised & Point of Care Solutions, Molecular Solutions, Tissue Diagnostics and Diabetes Care and offered the attendees an opportunity to gain a real insight into the Roche Diagnostics Divisions, their facilities, technologies, researches and discoveries which, together with Roche Pharmaceuticals Divisions, have been basis for implementation of the personalized healthcare strategy of this company. He stressed the company’s dedication to stimulate innovations by investing billions in research and development, making it one of the biggest investors worldwide. Furthermore, Roche has been recognized as the most sustainable healthcare company in the Dow Jones Sustainability Index for nine years in a row. Dr Matton spoke about the organization of Roche from the regional perspective, especially about the Subregion South East including Russia, Central and Eastern Europe, Middle East, Sub-Saharan Africa. Main focus of the lecture was diagnostics, which, according to his words, was so far unfortunately seen as a silent champion, since only 2 percent of healthcare budget has been allocated to in vitro diagnostics. Dr Matton explained that 60 percent of the world’s medical decisions have been made with support from in vitro diagnostics (IVD) solutions, such as those provided by Roche Diagnostics, an industry leader in this field. The numbers speak for themselves – every year 17 billion tests covering multiple diseases are conducted with Roche Diagnostics instruments in more than 150 countries. 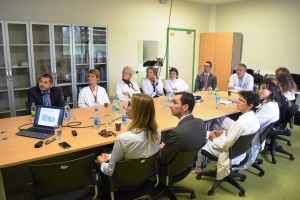 Our guest expressed the aspiration of Roche to be a partner in Bosnia and Herzegovina maintaining a focus on long-term goals that would bring benefits to patients and would be simultaneously cost-effective. The emphasis was given on testing efficiency implicating faster results and shorter turnaround time in laboratories and in hospitals in general, as well as on medical value delivered by tests for screening, diagnosis, prediction, and monitoring of disease. When it comes to screening, example was shown through HPV test identifying women at risk for developing cervical cancer. In relation to diagnostics, Dr Matton mentioned NT-proBNP gold standard biomarker for early detection of heart failure in high-risk patients and optimisation of therapy. Also, use of Roche’s troponin T-high-sensitivity test that provides one-hour diagnosis of heart attack and shortens the length of stay in emergency department and contributes to cost saving was described in detail. Attention was also given to patient stratification with HER 2 companion diagnostics empowering clinicians to select patients that would more likely respond to a targeted therapy, as well as to monitoring and use of CoaguCheck systems monitoring patients on anticoagulation therapy in hospital and patients’ settings. Dr Matton also spoke about Roche consultancy services covering different levels of consultancy – technical, process and strategic consultancy. The aim of Roche consultancy teams is to help laboratories and hospitals to become more efficient in their operations, to improve productivity in terms of turnaround time, sustainable growth and to make quality and safety improvements. A special attention was given to Roche’s personalized healthcare approach aimed at providing the right treatment for the right group of patients by implementing the companion diagnostic solutions. According to his words, development of medicine has been directed towards personalized treatment requiring knowledge of numerous parameters, so that IVD development has become an imperative for a healthcare system wanting to keep pace with the time. Dr Matton concluded his lecture by expressing readiness to strengthen our future cooperation and commitment to provide support to our healthcare system. Following the lecture, Professor Zdenka Gojkovic, MD, PhD, Head of the Oncology Clinic emphasized the significance of large-scale application of biomarkers representing a target in oncology therapy especially regarding HER 2 and BRAF mutations and expressed hope that a new lecture on liquid biopsy genome sequencing would be held. Professor Gojkovic and Assistant Professor Tamara Kovacevic Preradovic, MD, PhD, Head of the Cardiology Clinic agreed on the importance of future application of GDF 15 for patients with atrial fibrillation as well as for oncology patients being also on anticoagulation therapy. Taking into account that our Laboratory deals with 2000-2500 samples on a daily basis and 1 100 000 -1 200 000 tests on an annual basis, Sanja Avram BSc in Medical Biochemistry, Head of the Institute for Laboratory Diagnostics, raised a question regarding the best possible way to implement laboratory automation in a sense of service quality, turnaround time, efficiency of employees and long-term cost saving. Dr Matton advised starting with steps in order to automate the whole lab, emphasizing the use of solutions which would simplify operations, reduce manual operation, increase safety of patients, lead to greater cost effectiveness and compatibility and reduce risk of errors. 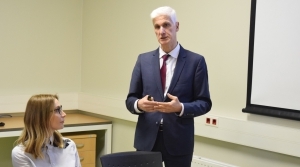 Impressions from the lecture were also presented to the General Manager Professor Vlado Djajic, MD, PhD who informed our distinguished guest about current activities in our institution and expressed readiness to deepen the existing cooperation between Roche company and the UCC RS. It is of utmost importance to emphasize that this was the first time that such a high-ranking representative of a diagnostic division of a healthcare company visited our institution.